Back in May 2016, I started a series of nine posts about Bucks County and New Hope. This is the eighth installment of this series. At one time, more than 50 covered bridges stood in Bucks County, many of them spanning the Delaware River crossing into New Jersey. Bucks County still boasts 13 lovely, historic covered bridges -- 10 of which still carry vehicles. Since their construction in the late 1800s, the covered bridges of Bucks County have symbolized the quiet rural life in the area. 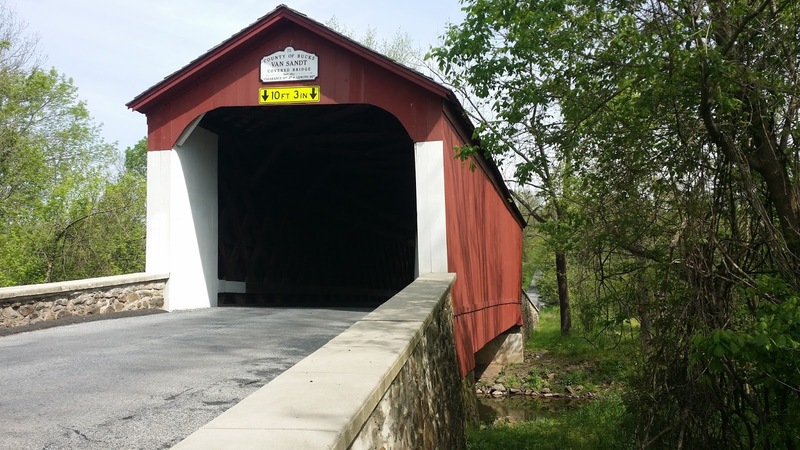 Bucks County was once home to more than fifty covered bridges. The 1930s brought the demolition of several of Bucks County’s covered bridges. And neglect, floods, arson, vandalism, and progress threaten the remaining bridges. The covered bridge tour makes a large circle through Bucks County and is planned so you can start at any one of the bridges. It is possible to make the trip in one day but since it is 90 miles long, and will bring you over some rural unmarked back roads, it makes the most sense to break up the trip into segments. It takes you through some of the most gorgeous farmland countryside I've ever seen. In the interests of time, we only visited a three of the covered bridges: the Van Sant Covered Bridge, the Loux Covered Bridge and the Cabin Run Covered Bridge. The Van Sant covered bridge is thought to be one of the most haunted spots in Pennsylvania. Many paranormal investigators have spent late evenings here gathering data. Throughout the bridge cold spots have been felt, cries heard, and apparitions spotted. So why all the paranormal activity? Many urban legends haunt this bridge. According to one legend, a man murdered a woman and her child on the bridge and now she haunts the area mourning the loss of her child. Others think it's the murderer who's still hanging around, literally, since local ghost hunters claim to have spotted an apparition hanging by a noose from the rafters. Other local legend's say the woman drowned her children herself, after giving birth at a young age and out of wedlock. This particular legend is fairly common folklore for many rural covered bridges, which are also often called "cry-baby bridges," because people have heard the cries of a baby as they passed over the bridge. Nothing so dramatic occurred during our visit, but perhaps the sound of the baby was obscured by our closed car windows and the hum of the car's air conditioning. and did I think to check it? No, not until it was too late. 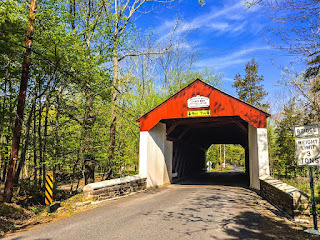 Loux Covered Bridge is located on Wismer Road crossing the Cabin Run Creek upstream from the Cabin Run Covered Bridge in Bedminster Township and Plumstead Township. It was built in 1874 by David Sutton out of hemlock in the Town Truss style. This is one of the shorter covered bridges in Bucks County at only 60 feet long. Showing the distinctive white entry with red body design, the Cabin Run Covered Bridge is located in Point Pleasant, Plumstead Township. The bridge was built in 1871, and is 15 feet wide and has a length of 82 feet. The Town truss bridge crosses the Cabin Run Creek downstream from the Loux Covered Bridge. 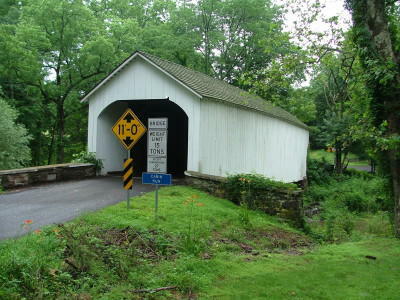 Websites: Several websites offer information and directions about the covered bridges of Bucks County. Before you go, print out the directions from the Bucks County Tourism Bureau (http://www.visitbuckscounty.com/things-to-do/planning-ideas/covered-bridges/). You may want to check out the Bucks County Covered Bridge Society at http://www.buckscountycbs.org/tour-the-bridges.html. For other day trip destinations in and around Bucks County, go to the Blog's Find a Great Place to Day Trip or click on the Bucks County label below. A Different Kind of Gettysburg Spirits!